By Reel Doc, February 3 in Questions About Trout & Salmon Trolling? Looking to get on the water early this Spring for the first time. With shallow water setups what type of leader sizes and lengths are used, specifically when trolling streamers and also for stickbaits or spoons running 10-20 feet down. Thanks in advance for the info! I would suggest you look up "Fish Doctor Charters" out of Oswego. Capt. Ernie is one of the best brown trout fishermen on the lake. Go through the archives in his fishing blog. He has extensive information on his spring tactics, all the information you are looking for. For my leaders I'm using 10-12' of 8-12# fluorocarbon. I cut them back as needed and once I see them get down to 6-7' I consider getting fresh ones. I always use a micro swivel for the connection. 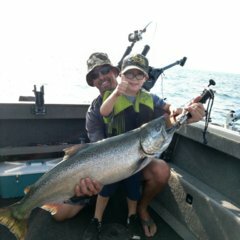 And of April out of Oswego i look for muddy or green water it will be a little warmer and fish 10 to 20 feet of water .Use mag lips and mutzui stick baits of boards and run a long center lead core and a short center weighted steel and pound the browns . Once you find the pocket of fish stay with them i try to get the sticks to tick bottom its pretty much a goby pattern . I run about 10 feet of 15 lb blue label and use a very small duramax swivel to attach to main line and just a duel lock snap to attach bait of choice . Need to buy some new set ups? Reel and rod recommendations? Would like to buy local and not in the big chain stores. Brown program doesn't require anything "high end". Basic line counters for monos, any type of levelwind reels will do for other setups. I have 17 size up to 30s for leads. Any rod will do but I like medium / medium heavy since I'm pulling inline boards, but again nothing fancy or high end. For browns a decent M or ML 8' will work fine, size 20 LC reels will be more than enough. If you want decent cheap combo, Daiwa Wilderness rod and Okuma Magda Reel with catch browns all day and should cost you under $80 per combo (Under $70 on Fishusa.com). Keep an eye out in the classifieds here for rods and reels, Daiwa Accudepths or Okuma Convectors are a step up from Magdas. I spool my reels with 12lb Berkley Big Game mono and 10lb flouro leaders (6-7'). great info, going to make a run out to narbys or capt cove. Starting to get the itch!! !